The August 2014 issue of ICMJ's Prospecting and Mining Journal is available for FREE online! Find out for yourself why we have the most respected prospecting magazine in the industry. We are currently running an online subscription promotion. For a limited time, you can get an online subscription for only $19.95 per year (12 issues) -- a 28% savings! This offer will end August 31, 2014. 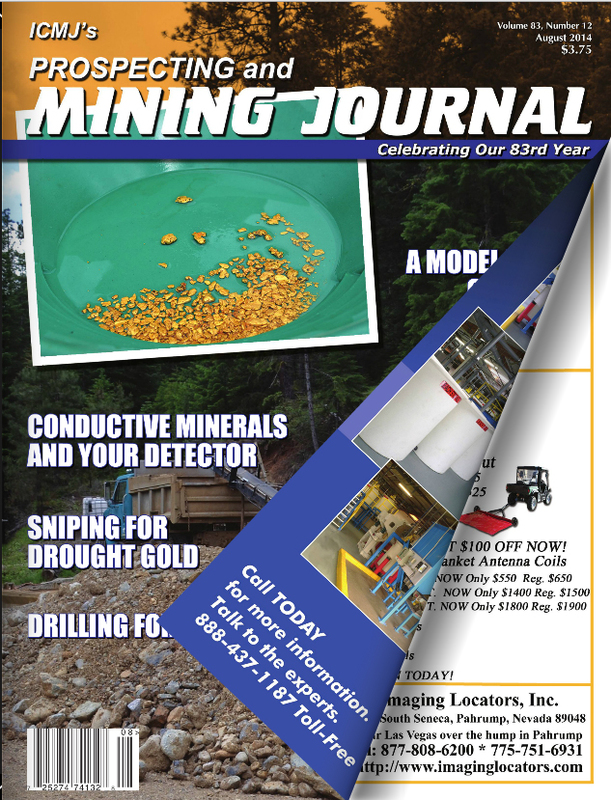 And don't worry if you prefer receiving the print version of ICMJ's Prospecting and Mining Journal. We have no plans to discontinue the print version, we are just reaching out to those who might like to receive our monthly publication on their desktop, iPad, Android, Kindle or other handheld device. Online subscribers can view articles in our traditional format on our website, or download the new 3D flip version and take it with them. The flip version features live website and email links. An online subscription also offers you the ability to read, search and print articles we've published over the past 15 years! Featuring: Gold mining and prospecting ventures, equipment, how-to articles, detecting, regulations, assaying, refining, dredging, geology, history and first-hand accounts.